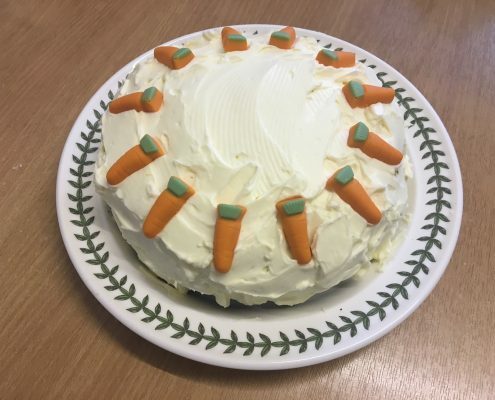 First up in our easter bake off we have Carole’s large cake, one of our sales managers, she has made a delicious carrot cake. It was a different recipe from your original with extra ingredients including honey and mashed banana. Decorated with yummy icing and little carrots, relating to those bunnies at Easter. 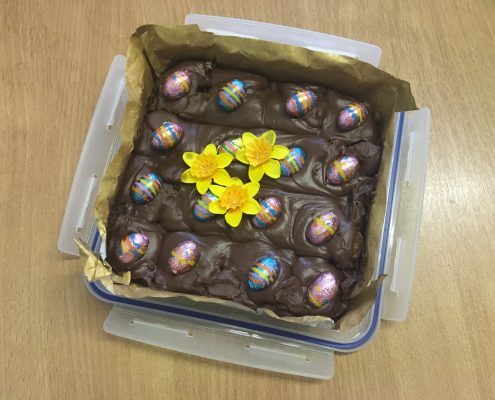 Next up we have Carol’s, our administrator at Bevlan, who baked up these chocolate brownies with little easter eggs on the top. They are filled with chocolate, baileys, caramac, caramel, and even more chocolate. They are definitely a chocolate lovers dream! Then we had Kirsty’s, our marketing coordinator, bringing in a easter mini egg themed rocky road. 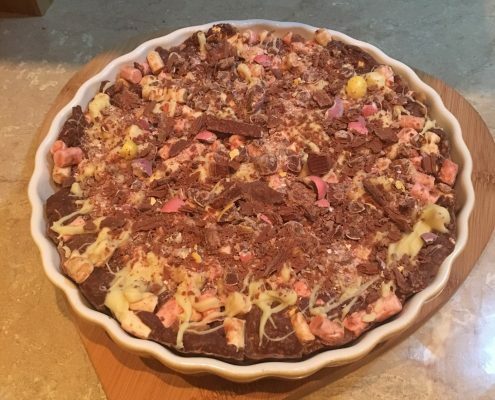 Using melted chocolate, marshmallows, mini eggs, fudge, syrup and shortbread all mixed together and then chilled, after that adding more white chocolate, mini eggs and twirl to the top for decoration. 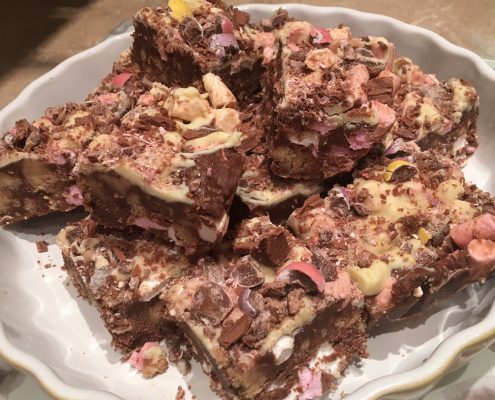 Using the mini eggs as a little Easter themed rocky road. Our other sales manager, Alicia, brought in Easter themed cupcakes. 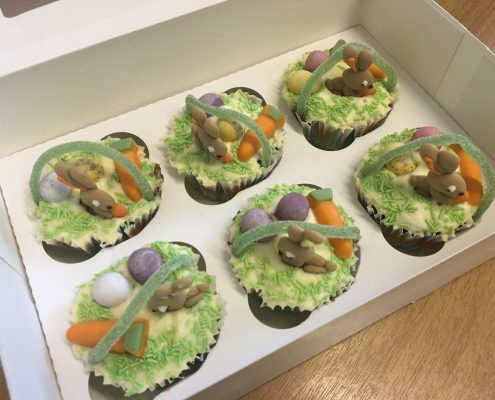 They are chocolate cupcakes with a vanilla icing, green sprinkles to resemble grass, mini eggs, carrots and bunny, also with a fizzy sweet lace to go over the top to resemble a handle of basket. Very Easter themed. 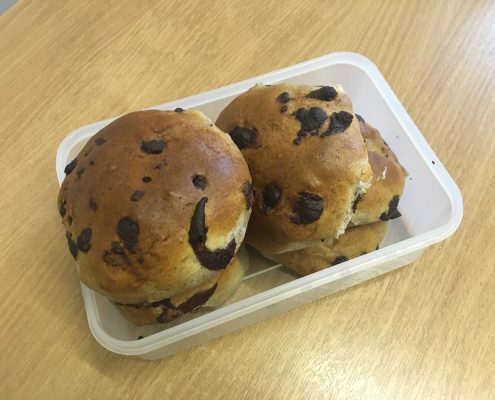 Our lead generator, Sheila, brought in a chocolate twist on the hot cross bun. They are chocolate hot cross buns filled with bits of chocolate, but without the crosses as she says! A savoury spin to our Easter bake off. 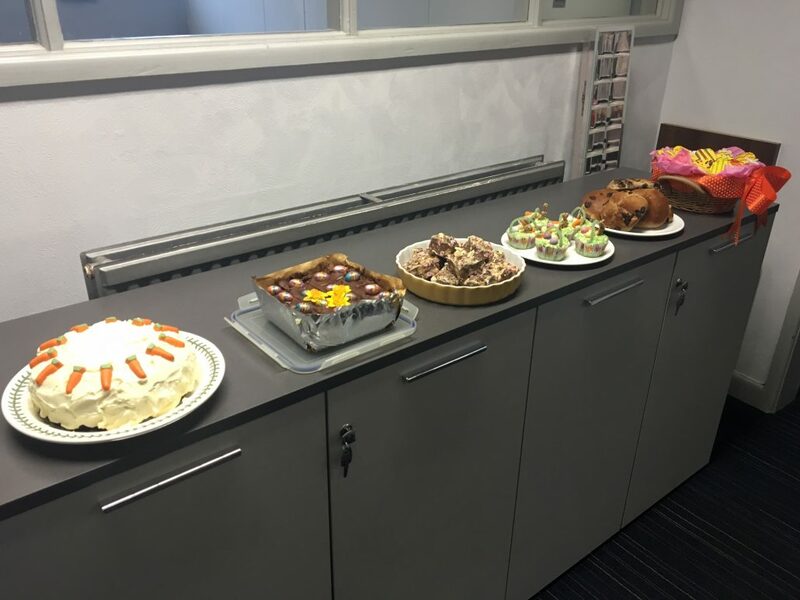 Last but not least our Financial Director, Wendy, baked up a favourite – shortbread mmm. 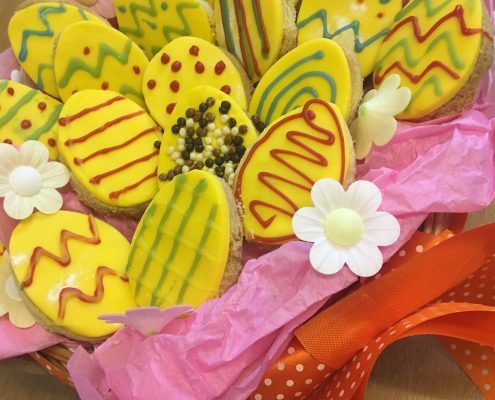 Using a traditional shortbread mixture Wendy cut it into egg shapes and decorated them to look like Easter eggs, presented in a cute easter basket and paper flowers!